Sponge Cake was apparently Queen Victoria's favorite. In 1855 Queen Victoria enjoyed afternoon tea with formal dress and cake . . . .and so of course I made it for our Victoria Day long weekend in Canada which is held in May. I checked UK recipe sites on the proper preparation of Victoria Sponge cake. . .they are all nearly exactly the same. . .and they measure their ingredients. They use equal weights of flour, sugar and butter. They generally do not call for milk except for a small amount .. a bit at a time until the batter slowly drops from the spoon. My friend Jill sent me this recipe which she found from allrecipes.com where I often find tasty things to bake and cook. I used the list of ingredients to make my cake. . .and added a pinch of salt. . .don't all cakes need salt? I baked my cake in a 6 inch across and 3 inch high cake pan. The batter rose perfectly to the top. It did sink slightly in the middle. .but with a fluffy whipped cream topping. . .who knew? The other thing that I never do ...is grease my pan. . I simply cut out a piece of parchment paper to line the bottom. I want the batter to climb up the pan. . .and when it is greased. . it is hard to climb up. Not greasing helps the cake to stay level .. .in my opinion. Another important note about cakes that are baked with butter. They really are best served room temperature. Once the butter hardens in the cake. . it seems dry. .but served fresh the day it is made. .the crumb is tender and moist. Put the cake together with custard and cream. .no more than an hour before serving. Refrigerate until serving. Of course you could impress your guest by completing it while they watch. . .
Preheat oven to 400 F. Trace around your cake pan. . .and cut out parchment paper to line the bottom. The recipe called for an 8 inch pan. . .I used a 6. . .so experiment with what you have. In your mixer bowl, cream the butter. . .and then add the sugar and whip till light. Add the eggs. . .one at a time. . .until each egg is completely beaten in. Add 1/3 of the flour. . and then 1/3 milk. .until both are added in .. .and then the vanilla. Bake the cake . ..for 20 minutes. . and then test. Mine took longer because it was a higher pan. I turned my oven down to 375 for another 10 minutes. . .and tested with a toothpick until it came out clean. I then let the cake cool in the pan upside down for 10 minutes and removed to cool completely on a wire rack. I split the cake in half. . . filled with a simple custard that I've used for years. . Blend dry ingredients in a medium saucepan or microwave safe mixing bowl. Add the egg yolks and the milk. . .whisk . .and heat until it comes to a boil and thickens. . Whip 1 cup of cream and 2 tablespoons sugar .. .and pop it into a piping bag with a large star tip. .pretend you are an artist. . or a kid. . have fun swirling on top of the cake. . and garnish with some fresh berries. I lay awake thinking about it one night ... and came up with the following recipe ... and to my delight, not only does the dough handle extremely well but the Rollkuchen taste VERY much like the real thing. They even 'puffed' up! I met my 'tester' non-gluten-free husband at the door when he came home and said ... "Here - close you eyes and take a bite and tell me what you eating!!" He dutifully complied ... and said ... "Rollkuchen? they are awesome ... now I just need some jam to go with them!" My daughter's response ?? "MOM! HOW did you do that ?? HOW did you make them SMELL like wheat?? How did you make them taste just like the real ones ?? You HAVE to put these on your blog!" I smiled, feeling quite gratified!! Sometimes it is quite permissible to substitute one flour for another in gluten-free baking but I think exchanging any of the flours from the mix I used would not bring about the same satisfying results . Thoroughly blend all dry ingredients. Put butter, egg and milk in mixer bowl and blend. Add dry ingredients and beat for a couple minutes until dough is fluffy and smooth. Turn out onto lightly dusted counter surface (sweet rice flour) and work just enough sweet rice flour into dough until manageable. Put dough in a bowl, cover with plastic wrap and refrigerate for 1/2 hour. 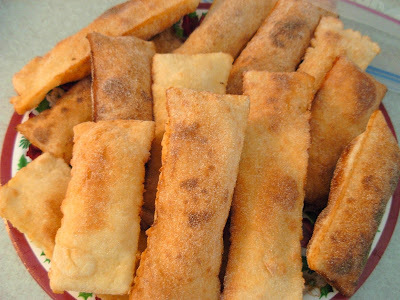 Roll out quite thin on dusted surface, using as little sweet rice flour as possible, but enough to make dough easy to handle. Cut into strips of desired size. Deep fry in about 1/2 inch of oil in a frying pan, until golden brown - turn to brown both sides. The oil needs to be hot, but not so hot that you find they are browning too quickly. Slip each strip into the oil and tickle the tops with a fork to encourage them to 'puff'. They are good warm or cold - with watermelon, of course, but are also good with soup, or with jam or syrup as we enjoyed them as kids. I need recipes for baking. . but when it comes to cooking, I often put together dinners from previous flavours that I enjoy. 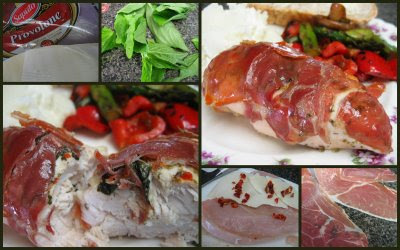 This chicken recipe is easy and can be made earlier in the day. . .refrigerated and popped in the oven 30 minutes before you are ready to serve. Cheese of your choice. I used Provolone. Slice almost all the way in half. . horizontally the chicken breast. Put a slice of cheese and a small sprinkle of sun dried tomatoes. Close the chicken breast up and sprinkle with Italian Seasoning. Lay one Basil leaf on top. Lay each breast on a Baking Pan. . .leaving enough room between each piece of chicken for adequate browning. Brush each piece of Chicken with a bit of Olive Oil. Bake at 425. . .for 20 minutes. . .slice one to make sure it is no longer pink in the middle. . Remove the chicken from the pan. . .pour the juices and scrape the browned bits into a small saucepan to reduce for several minutes. .pour over chicken. Greek Seasoning and Feta Cheese is a very good flavour combination. 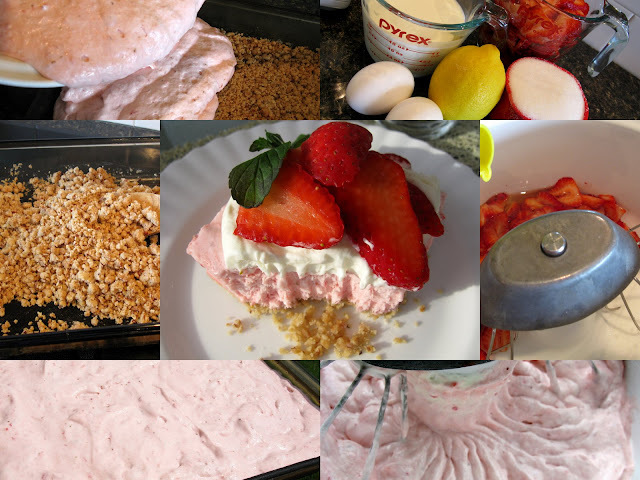 This whipped, frozen strawberry dessert is a cool treat for a warm summer day. I've been making it for decades, ever since I tasted it at a summer barbecue. It is from a local church cookbook, submitted by a Bev K. That happens to be the same Bev that is also a contributor to this very blog. With local strawberries now available, it's the perfect time for trying this flavourful frozen delight. Place flour, brown sugar, chopped pecans and melted butter into a 9" x 13" pan. Bake in a preheated oven at 350º for 20 minutes...stirring occasionally. Pack crumbs firmly into the bottom of the pan with a fork. Combine egg whites, sugar, berries and lemon juice in large, deep mixing bowl. Beat on high speed until stiff...about 10 minutes. Whip the whipping cream in a separate mixing bowl....and fold into the strawberry mixture. Spoon over the cooled crumb crust in the pan. Place in the freezer and freeze for at least 6 hours or overnight before serving. Remove from the freezer about 10 to 15 minutes before serving. Cut into squares and serve partially frozen. 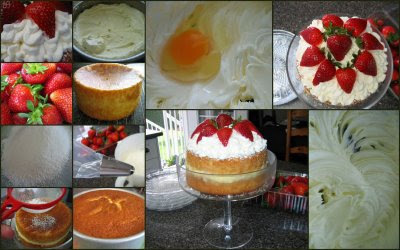 Top individual servings with a dollop of whipped cream and sliced fresh strawberries (if desired). * Editorial note: Pregnant women, children and people with compromised immune systems should not consume raw eggs because of the possibility of salmonella. Pasteurized egg whites are readily available in the egg section of the grocery store. Crisps are such a quick dessert to throw together when company walks in the door. If you have some fruit on hand and basic pantry ingredients, you will never be in a pinch for something to serve. Rhubarb is one of our favorite crisps. I love to serve individual crisps. It makes serving a cinch and everyone gets the perfect amount of fruit and crispy topping. To make it easier yet. . .I am providing the ingredients. . .per person. . . do a little math. . and you can make it for four. . .or two. . .or eight. Spray your individual small gratin dishes or 8 ounce ramekins with cooking spray. . or use a square pan for four people. 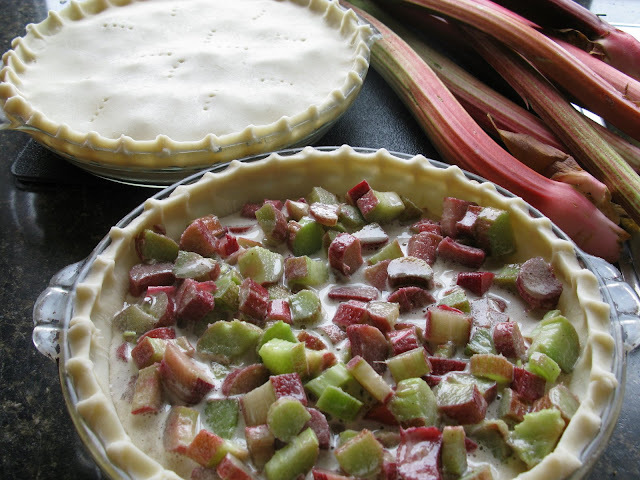 Divide the rhubarb into each dish. In a food processor. . . (not at all necessary). . combine your butter, brown sugar and flour. Dump the butter mixture in a bowl. .. and crumble in your oats with your fingers. . .until well mixed and crumbly. Evenly divide the crumb mixture over each gratin dish. Preheat oven to 375. . .and bake until the top is crunchy and well browned. . and the bottom has formed a thick bubbly sauce.. . .about 35 minutes. I pop these in the oven while we are eating dinner. They can be put together in the afternoon and left to sit covered with plastic wrap on the counter. This is a great way to serve a Roast Beef Dinner with lots of gravy, for Sunday (or any time) without having a lot of work when company walks in. 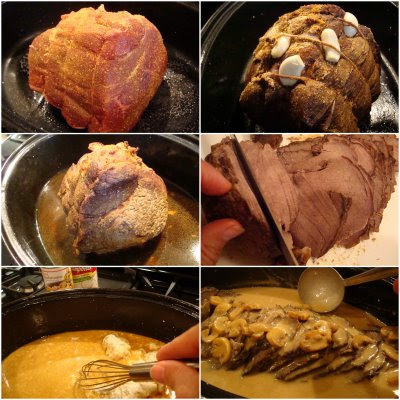 Roast Beef served this way goes far, because the trick lies in slicing it thinly, which is easier once it’s cooled. When shopping for a roast, look for one that is not too big, sort of shaped like a loaf. It should be lean and look like it would slice nicely. (Imagine slicing it like a loaf of bread) It’s okay if it has fat along one side, but it doesn’t have to. Boneless top sirloin, inside round roast and cross rib roasts are good. A 3 pound roast will serve 6 – 8 people. It’s also great as a left over. Season roast with Lawrys seasoning salt. Place roast in a roasting pan that has been sprayed with Pam. Bake uncovered at 350° F for ½ an hour. Take roaster out of oven and place a couple of cloves of garlic under the twine or on top. Cover with lid, turn oven down to 300° F and continue baking for another 1 ½ hours or until meat thermometer registers at 155° F.
Once, roast is cooled, slice it as thinly as possible, using a sharp knife. Put your roaster with the drippings from the roast on medium heat on the stove. Stir in 1 can cream of mushroom soup and 1 can sliced mushrooms. Stir until it cooks. Taste for flavor - if it's too salty, shake up 1-2 Tbsp flour and 1 + cup water in a closed container and add, according to taste. Using a large lifter, add the sliced meat to the gravy, leaving it sort of intact. Scoop some of the gravy on top of the meat. You can now re-heat it in the oven right away for 15 min or refrigerate it and re-heat it the next day for about ½ hour, during which time you cook and mash the potatoes. When it’s time to serve, lift it out with a large lifter to put on a serving platter. Pour a bit of gravy on the meat and the rest into a gravy bowl. Rösti is a traditional Swiss potato dish...considered by many to be a national dish. When we were in Switzerland visiting our friends (Pierre and Ute) many years ago, we were invited to Pierre's mother's home for supper. I will always remember her warm hospitality...how she bustled around in her cozy kitchen and served us a delicious dinner which included rösti. It wasn't too long after our visit that Pierre's mother passed away and so any mention of rösti brings back fond memories of that dear old lady. After a little research and a few trials, I'm ready to pass along my method for cooking 'glorified hashbrowns'...or rösti. A plate that barely fits inside the pan. Grate the raw potatoes into a bowl, with a large-holed grater. Use a non-stick skillet. Melt 2-4 tablespoons of butter in the pan. Saute onions until somewhat tender. Add grated potatoes and salt. Cook over medium heat several minutes, stirring two or three times to coat the potatoes evenly with butter. Then pat the potatoes into a cake with the spatula and let cook for 10 minutes. Cover and cook for another 5-10 minutes. When the bottom of the potato cake is golden brown, place the plate on the potatoes and invert the pan, holding onto the plate. Remove the pan and set it back on the stove. Add another tablespoon or so of butter and let it melt. Slide the rösti back into the pan, golden side up, and cook for about 15 minutes, pressing down once or twice to make the pancake stick together a little more. You can cover the pan to ensure the potatoes are cooked in the middle, but remove the cover at least 5 minutes before the end, so that your pancake is crispy on the outside. Slide rösti onto plate and serve by cutting into wedges. Serve as a side dish with ham and salad...and call it dinner. Or, make it the main course and top with a sunny-side-up egg. Any way you serve it, you can't go wrong! A cast iron pan seemed like the perfect cooking utensil for rösti but I soon found out that my 'almost new' pre-seasoned cast iron skillet required a little more seasoning! Once it was coated with a thick layer of potatoes, I switched to a non-stick pan. I'm sure Pierre's mom used cast iron but my Canadian version is cooked in a T-fal pan. when our oldest son was working there as a missionary. They were truly memorable and I asked Tim to get the recipe for me. The first time I made them was in our camper on a trip to the Maritimes. Each town on the Gaspe' Peninsula had it's own fresh fish shop and we treated ourselves to fresh shrimp and lobster at every opportunity. If you make these once, I guarantee you'll make them again. *I use the largest prawns or shrimp I can find. Using the raw ones ensures that they will not be overcooked and rubbery. Beat egg whites just until they are foamy and soft peaks form. Do not overbeat as the egg white will not stick to the prawns if they are too dry. Place coconut in another shallow bowl. Coat each prawn with seasoned flour, then dip in egg white until well coated, then transfer to coconut and coat gently on all sides. Drain on paper towel and serve. 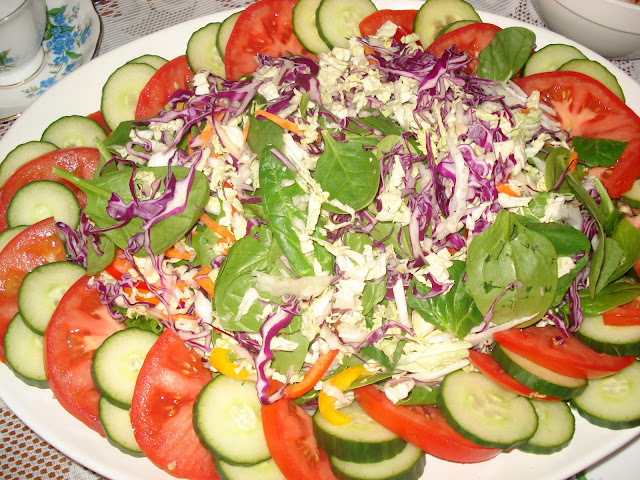 I got this recipe from my good friend, Herta K. and it’s the salad that I make most often, even if I just have lettuce, cucumber and some colored peppers. The flavor in this salad is enhanced by the fresh basil, but if you do not have it on hand, just use about 1 ½ tsp of dried basil mixed in with the dressing. For the mustard in the dressing, I like to use a Country Dijon mustard or one that has whole mustard seeds in it. Shake dressing ingredients in a tightly covered container. Toss salad ingredients. Pour dressing over top and toss to coat, just before serving. This cheesecake is a must have for our oldest daughter. It has been her choice of desserts since she was a little girl. My Tante Helga introduced us to this velvety smooth mousse type dessert and it comes from our home church cookbook submitted by T. Bergen. 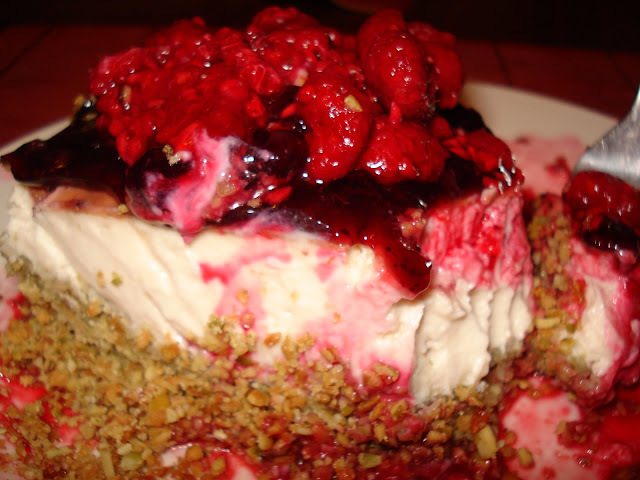 (By the way T-your reputation for a wonderful baker is proof in this dessert). or 1 can of blueberry pie filling with a squeeze of fresh lemon to brighten the taste of the pie filling. One prepared graham wafer crust, either bought or your favorite recipe. (try chocolate wafers as an alternative, it is very nice also). Press into a 9" spring form pan. Fold in cool whip until smooth. Set in fridge for several hours to set. Top with blueberry pie filling and added berries if you would like as in the above picture. I have made a variation of cream soups quite often because they are so quick and easy. However, unlike soups that get better the longer you cook them, it is best to serve cream soups without cooking them too long. Acid, heat and salt can cause milk to curdle, and even more so if you use a low fat milk. In order to avoid this problem, do not boil the soup hard or long and add the bouillon cube flavor at the end of the cooking process, without bringing the soup to another boil. I have revised my written recipe here, specifying to add the bouillon flavor (salt) at the end. Make a white sauce by melting butter and stirring in the flour with a whisk. Gradually stir in milk and 1 cup water (or broth) and keep stirring until it comes to a boil. Add cheese, chopped leeks, potatoes and bacon. Simmer on low for about 5 – 10 min, until leeks have changed to an olive color. Add bouillon flavoring dissolved in 1 cup boiled water, OR rest of broth. Also, some pepper if you like. Stir and serve. Keep warm on very low heat, if you must. Refrigerate left over soup immediately and re-heat without boiling. 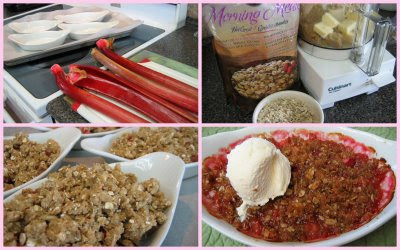 I have been making this Rhubarb bar for years. Every spring, the rhubarb in the garden is the first thing that is harvested and everyone is always happy for a taste of spring. In a large bowl, combine the flour and salt, cut in the butter and shortening until the crumbs are the size of oatmeal. You can use your food processor for this too. Pulse, don't run at full speed. Put the egg yolks in a measuring cup and add enough milk to make 2/3 cup. Slowly add to the flour mixture and pulse with the food processor until it begins to come together or mix in with your fork. Turn the pastry onto the counter and knead it into a ball, just until it comes together. Wrap in a plastic wrap, shaping it into a flat rectangular disk. Chop rhubarb into about 1/2 inch square pieces. Add the sugar and tapioca and set aside. Take the dough from the refrigerator and divide in half. Roll each piece out thin enough for a 10 X 15" pan or use the same amount of dough for a 9 X 13" pan plus a 5 X 7" pan. This dough is rolled very thin. Use a bench scraper to carefully lift the dough. Don't be afraid to add a bit of flour if you need to. 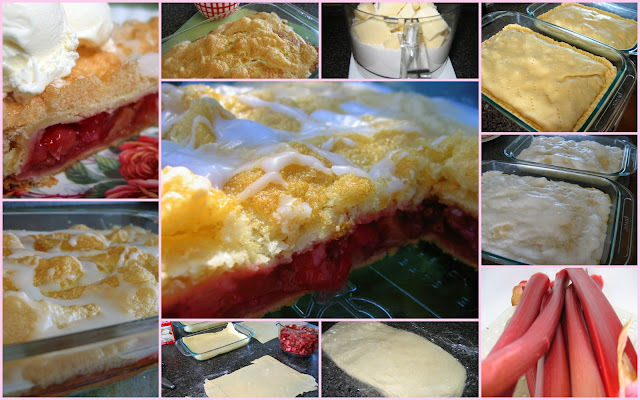 Once you have the rhubarb covering the first piece of dough, cover with the second piece of dough.. . and crimp the edges together. Whip the egg whites until they just begin to stiffen. Use your hands to spread the egg whites over the pastry. Bake at 400 degrees for 35 - 40 minutes. . or until golden brown. While the bar is still warm, combine icing ingredients and drizzle over top. My wonderful Aunt Emmy used to make these cookies and gifted me with the recipe for them. I've photographed these cookies on the one surviving plate from my mom's everyday dishes - Somehow this plate, which brings such warm memories to me, always enhances the taste of anything dished out on it. * My mom taught me to wash sultanas, running water through them until the water ran clear. Shake the water off and add to recipe. Blend white and brown sugars, eggs and margarine in large bowl of mixer. Add remaining ingredients in order. Bake at 350 degrees F for 8-10 minutes. Do not overbake. Remove to brown paper or racks and cool. When I was growing up our family always went to church on Sunday morning and evening. Often after church on Sunday evenings my parents had several couples over for coffee. Mom would have a light lunch ready for her guests and us four kids always looked forward to the food. This is just one of the desserts she served on such occasions. The butter crust has a very delicate texture, and compliments the light pineapple filling and coconut meringue. Using a pastry blender cut the butter into the flour until you have a fine crumble. Press into an 8x8 pan and bake at 325º for 2 minutes. Take out and let sit while you make the pineapple filling. In a sauce pan stir together pineapple, sugar and cornstarch. Stirring constantly, bring ingredients to a boil until it thickens. Beat egg whites, sugar, baking powder and salt together until soft peaks form. Spread meringue over pineapple mixture. Return to oven and bake another 20 minutes until the meringue is a light golden colour. It is best to let this square cool before cutting to let all layers set. These do not freeze well. This recipe was given to me from my friend Marg. It is a great side dish for steak. In the photo I have shown the mushrooms served the way they are when they come out of the crock pot, and the others have simmered in cream for 10 minutes after they come out of the crock pot. Put washed mushrooms into a large crock pot. (you can use a large stock pot and cook over low heat following directions the same) Combine the remaining ingredients together and pour over mushrooms. Set crock pot on low setting and cover. Cook for 4 hours. Remove the lid and cook another 4 hours. To serve remove mushrooms from liquid with a slotted spoon. Discard liquid. Pour 3/4 cup cream into a non stick fry pan and and heat over medium until it begins to get hot. Add cooked mushrooms and simmer for 10 minutes until cream thickens. I have searched my recipe books looking for my Mom's raisin bun recipe but couldn't find it. Finally I found one in Canadian Home Cooking that comes quite close to Mom's. I would add more raisins next time. Scald milk and stir sugar into milk and cool to lukewarm. Add beaten eggs, mashed potatoes, salt, oil, and flour. Mix and knead until you have a smooth soft dough, approximately 5 minutes. Allow to rise for 25 minutes, punch down and knead in the raisins. Let rise again till double in size. Grease pans, form buns, place on parchment lined pans and let rise again for 30 min. Bake in 350º oven for 11 minutes. I've been making this peanut butter cookie recipe that my mom in law gave me for years. Bake in a 350 F oven for 12 minutes or until golden brown . .I prefer these crunchy. Let cool and then store in freezer bags in the freezer. May is the month for fresh strawberries or use up the frozen strawberries in your freezer so that you can freeze some fresh ones again. My mom always taught me to use up the older freezer products before replenishing. I still like to with that motto. When my family was younger I used to make their favorite dessert. It is so easy and yet so yummy that everyone will ask for the recipe. Tonight I served it for my son's birthday and sure enough. "Can I have the recipe?" I made up this title, because I do not know the origin of this recipe. Make sure you stir long enough so that the jello is all dissolved. This will make your jello thicken very quickly (5-10 min.) Stir frequently. Then fold in your whip cream or Cool whip. I usually pour this into parfait glasses or fruit nappies. Add frozen strawberries to the hot jello mixture. Spoon into dessert nappies and garnish with a fresh strawberry. And I can promise you that your guests will ask you for the recipe. It's light, cool, and refreshing especially on a warm evening. Every once in a while when our daughter's were growing up they would copy down a recipe from one of their friend's moms. This recipe became a favorite of ours and we called them Mrs. Neufeld's cookies. The secret to them turning out almost like bite size brownies is taking them out of the oven when they are not quite baked. If you love chocolate these are for you. Cream butter with sugar until light and fluffy. Add eggs and vanilla and beat well. Combine dry ingredients and blend into creamed mixture. Stir in chocolate chips. Drop by teaspoonfuls onto ungreased or parchment lined cookie sheets. Bake at 350 for 8-9 minutes. Do not over bake. Let cookies rest on pan for 1 minute and then transfer to a cooling rack. Cookies will flatten when cooling. They should be very soft and a little chewy. This is a quick family meal, especially if you have meatballs in the freezer. If you don’t have any, go here (Apricot Glazed Brunch Meatballs) for a basic meatball recipe. Make the whole meatball recipe and freeze the leftovers for another meal. In a large skillet, over medium heat, melt butter, saute mushrooms onion and garlic until tender, stirring often. Add mushroom soup mixed with milk. Bring to boil. Stir in the sour cream and meatballs. Simmer 10 - 15 minutes, adding thyme near the end. Serve over rice or pasta. 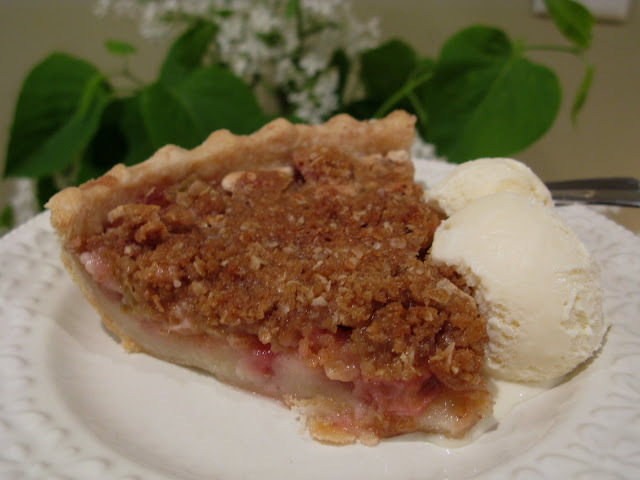 One of the best tastes of spring is rhubarb pie. 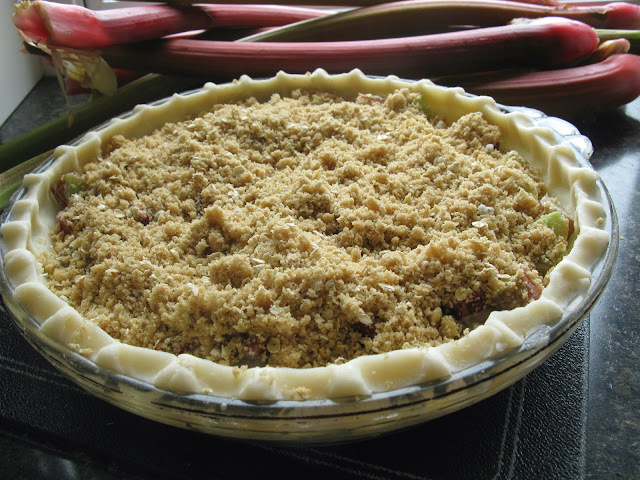 Rhubarb is now ready for the pickin' in gardens everywhere, so don't miss out. I have used the same rhubarb pie recipe for ever but this year I thought I would try a streusel topping. Just for a change. You can bake the filling in a traditional double pie crust if you prefer. Combine sugar, flour and nutmeg. Add to eggs and beat. Stir in rhubarb. Pour into pastry lined pie plate. Mix topping ingredients until crumbly. Sprinkle evenly over pie. Reduce heat to 350F and bake about 40 minutes longer...until rhubarb is cooked and topping is brown. Serve warm with a scoop of premium ice-cream. I have many people in my life that give me inspiration. . . . . I think of the dear girls that I share this blog with .. .
and the inspiration that they are to me. . Since this recipe blog began less than a year ago ..
friendships have been formed that are nothing less than God's provision for our souls. Years ago . . my mom belonged to a group at church called the "Dorcas Ladies Aid". They would meet once a month . ..to quilt or sew together. . share each others joys and sorrows. . to encourage and challenge each other . . and to look into God's word. I belong to a group sharing through our computers. . .called "Mennonite Girls Can Cook". We meet to chat over our computers. . .here and there through out the week. You, see the part. . .where we meet to share our recipes. . . but far more than that. .
behind the scenes we have found a safe place to share our hearts with one another. When one of us has a need. . .we hold them before our Heavenly Father in prayer. . When one of us. .needs a bit of love. . .we all ((((hug)))). When one of us needs courage to carry on. . . we all cheer!! When one needs a bit of advice. . .we offer bits of our own experiences that are tried and true. Besides being friends. . .these girls are all mothers. We are all either in process of emptying our nests. . .or we are empty nesters. Between us we have about 320 years of mothering. Each of us are our husband's wife. . our children's mom. . .and our parents daughter. The recipes that we share with you have all been made. . .
not for earthly financial gain. . .
but out of love. . .
for family and friends . Often the recipes have been quickly put together. . .
camera in one hand. . . phone in the other. .
inviting our children, parents. . .friends. . . and sometimes new friends over to help eat our wares. Time and time again. . . I have been amazed at the kindness that each "girl" has for her family. The love for her husband. . . her children. . grandchildren.. . . and her parents is evident by the quick adjustments and allowances she makes each day to meet all the needs around her. Each girl is purposing to pass what she knows. . .down the line. .
to the next generation. . . and also to you. There was a time. . that when sharing a recipe that was a bit tricky. . .
many homemakers were reticent to tell all. . .keeping back little tricks big tricks. . .keeping it their special secret in the kitchen. We all have an opportunity to leave a legacy in one way or another don't we? I feel blessed to be a witness to something very special happening here on this blog. There is no selfishness shown here. . .
only a joy in giving. . .and sharing. . .and a hope that young cooks. . will learn something worth passing on to their own families. 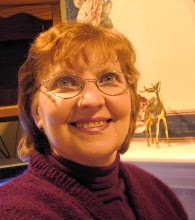 It is evident. . .that each girl that has contributed to this blog has a gift of hospitality. . .
a heart to bless others. .
and a desire to give and receive love. When I asked the girls to send me photos of their mom and mom in law so that we could honour them. .
they were quick to respond and willing to share. Many of the photos were sent with a longing heart. . .to see their mom again. Most of the pictures sent to me. . .were accompanied by loving words of honour, respect and sentiment by a daughter who has been loved by beautiful women. Often when we prepare the recipes. . .that our mom once made.. .
our memories are heightened by the aromas that we associate with being in mom's kitchen. 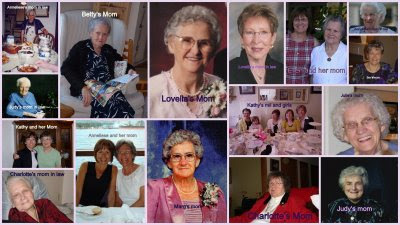 The moms we still have with us are cherished. . and honoured today. . The moms we miss will forever now hold a special spot here in the recipes that live on. To the girls that I am honoured to share this blog with. . I say . . .well done . . . I am so inspired by each one of you. Your commitment to put your families first in your lives. . .
is a legacy that will not be overlooked. I am certain. . that if I had called up the children of these girls. .they would all agree that they have amazing and loving moms. . .I'm sure of it. I have often said. . that I love it when God plants an idea in our hearts. .
run with it. . . something extraordinary is about to happnen. May we continue to honour our Heavenly Father in our homes with our gifts of hospitality. . This makes one fantastic, colorful salad, and without the dressing you can keep it for a few days, if it lasts that long. What makes this salad so fabulous is the dressing. When my family takes this salad to go we put it in wraps or in pitas, and add the dressing as needed, other wise it gets soggy. Add some grilled chicken and you have a complete meal. 1 small package whole wheat linguine noodles, cooked, rinsed and cooled. The noodles are completely optional. 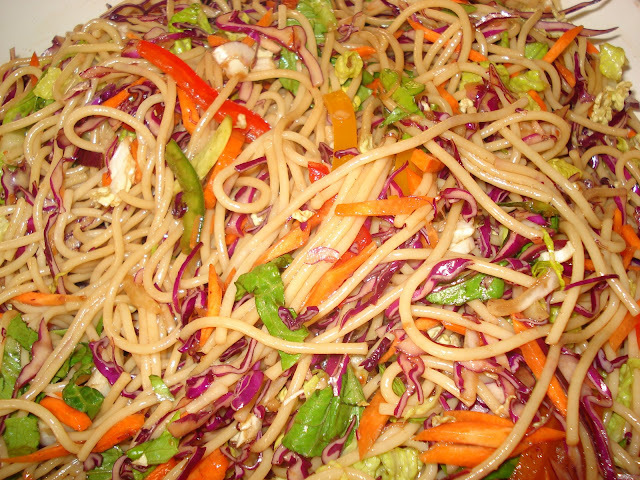 It makes the salad stretch for a crowd. If I know the salad will get eaten the same day I add tomatoes and cucumbers, add what ever veggie you like, the more the better, the more color the more appealing. Top with toasted nuts as an option. The recipe for the orginal Schnetki has been altered and modified over the years until it finally retains only its original ‘name’. Today, in most Mennonite kitchens it is now indistinguishable from a ‘biscuit’. I still make them the way they were made in the Ukraine by the Mennonites – the recipe passed on to me by my Mother in law. They have always held a place of honor in my kitchen – maybe more so than any other food - because of what Schnetki mean to my husband. Let me give you the background story. In the month of September of 1941 my husband’s life was forever altered. He was a 4 year old boy living with his parents and younger brother in a Mennonite village in the Ukraine. It was WWII, and the order had come down from the Ukrainian officials -- all men 16 and over were to be gathered out of the Mennonite villages and marched to Siberia. Because they were of German descent, they were now enemies of the state. My husband’s father was one of those men who were marched away under guard that September morning – many never to see their families again. The tearful wives and mothers tried to do what they could to send some items of comfort with their men, knowing that they would be encountering harsh treatment and impossible living conditions. My husband very clearly remembers watching his mother bake Schnetki on the outside hearth and pack them up for her husband. That was the last time he saw his father . The image of his father walking out of his life, carrying the Schnetki is forever imprinted on his mind! And for the 68 years since that day, Schnetki have been his ‘comfort’ food… perhaps subconsciously connecting them with the father he was robbed of. I could not count how many Schnetki I have made for him ….. and still do. When I ask him what he is hungry for I know the answer before I ask. Unless you are like my husband, with no need to watch cholesterol or high blood pressure or weight… you will not be rushing into your kitchen to make these Schnetki. I am posting the recipe to preserve the original recipes of our Mennonites in the Ukraine. Mennonites, historically being a hard-working people on the land , did not worry about calories or fat-content in food ! Even so – they have for the most part been a hardy, healthy people , enjoying longevity. There is a reason this ‘biscuit’ was named Schnetki . Schnetki is not a German word - it has obviously 'phonetically evolved' over the years from the word Schnecke meaning 'snail' and that will become self-explanatory as you see that the pastry is rolled up like a 'snail'. chill in fridge overnight! VERY IMPORTANT! and roll dough again ... repeating until all the dough is rolled and cut into desired lengths... approx. 4"
Bake in very hot oven 425' until browned ... about 15-20 minutes. When broken open they are very flakey. For plums or other fruit I will do the traditional four corners to the center style but for apples I always fold two sides up and over the apples. Cut the buttered pastery in squares and put 1/2 tsp flour and 1 tsp sugar on each square, lay apple on top and fold the two sides over. Schnetki are traditionally eaten with soup ....but I doubt there is a wrong time or meal to eat them .. according to my husband !